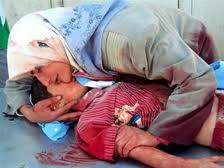 Iraqi Mother and Son--Nameless to us. Casey Sheehan, not just a number. In 1969, Swiss psychiatrist, Elisabeth Kubler-Ross published a groundbreaking book called: On Death and Dying. The five stages of grief listed above are called the Kubler-Ross Model and were originally designated for people who were diagnosed with a terminal illness but were extended to anyone who has suffered a major loss such as: losing a limb, losing freedom, or a death of a close loved one. As most of you who are reading this know, my son was killed on April 04, 2004, in the US’s illegal and immoral occupation of Iraq. He was a US soldier who enlisted to not only get college benefits, but also for some kind of misguided idea that he would be performing some kind of valuable service for his country. So far, in almost seven years of my grief, I have experienced the first two listed stages. When we were informed by the military that Casey was killed in action in Baghdad on Palm Sunday that year, my “denial” stage lasted as long as I laid on our living room floor screaming, “Nooooooooo, nooooooooo, nooooooooo, not Casey,” over and over. It felt like an eternity, but it was probably only a couple of minutes. I don’t know, but I am surprised I didn’t burst capillaries in my brain, heart or lungs after that episode. Since about 9:05 PM on that day, I have been stuck in stage two: Anger. The Anger stage of grieving can manifest itself in many ways. One can be angry with oneself for a stupid lifestyle choice that led to an illness or incapacitation. One can be angry with the loved one for his/her choices that led to death. I have never been angry with Casey—I have been angry with myself for not trying harder to stop him from enlisting or going to Iraq. In this stage it is very common to place blame. Besides blaming myself, (and my prison is the hell of living the rest of my life knowing I failed my son who died too early before he could really even live), I blame the rotten system here in the USA. At first, all my anger and recrimination was focused on the Bush administration, but as my knowledge and experience expanded, I realized that there was enough blame to go around: war profiteers, the media, the banksters, Congress, greed, the apathy of the average US citizen, etc. So, after almost seven years, why am I stuck in the Anger stage? I haven’t even gone through the depression stage and my oldest son was killed. I get up every day and mostly greet each day with the gusto of having a purpose greater than myself. There have been days, especially in the first year, when I felt that the pain was so overwhelming and unbearable that I would walk aimlessly around the house just picking up things and putting them down with tears streaming from my eyes. I spent hours journaling at Casey’s grave trying to make sense out of something that was so disordered, violent, and senseless. But I have never been depressed. Down, sad, wracked with pain, but not depressed. As an introspective person, I think there are two major reasons I am stuck in Anger—first of all; my grief extends to every single person who has been killed in these Imperial wars for profit. My dear son wasn’t the first one killed by US violence and the killing hasn’t stopped. Violence perpetrated by the US is a daily occurrence and the wound that was opened on 04/04/04 can’t even scab over. That’s why this piece is relevant in general, not just specifically to me. Millions of people have been killed, wounded, displaced or otherwise traumatized since 9/11/01. Casey’s murder is literally just a teardrop in an ocean of global grief caused by the lies and crimes that led to so much heartache. The second reason that I am stuck in Anger is that, even though the culprits for this pain have been self-identified, there has been no justice delivered. From Cheney having pre-invasion meetings with oil execs, to Condi having meetings with foreign diplomats saying that "the intelligence and facts were being fixed around the policy"(Downing Street Minutes) of invading Iraq, to George Bush even admitting in his recent book that he was an enthusiastic supporter of torture—the murderers of Casey, et al, should not be roaming free and prospering from their eight years of unfettered carnage. “It’s just not fair,” is the refrain that keeps running through my mind. I worked super hard for the impeachment of the Bush administration. I even ran for Congress against Nancy “Impeachment off the table” Pelosi for this very reason, announcing my run right before Congressman John Conyers, who was at that time Chairman of the House Judiciary Committee, had me and about 49 other impeachment activists arrested in his Capitol Hill office. 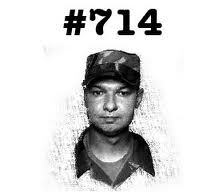 Even though the US has committed international crimes of aggression since they were more precisely defined after World War II, and since the US regularly violates UN resolutions and runs roughshod over the Security Council for its own interests, and not one US president has ever been held accountable, I have all but given up on my son receiving justice for his murder. It’s sad because I don’t think complete healing (of me, or humanity) and acceptance can be achieved without justice. I am not talking about revenge. Revenge is just perpetuation of violence. This planet has been set on the road to mutual ruin. Would Bush have felt so full of hubris if one of the war criminals that preceded him in office had to pay for his crimes? Would Obama feel so free and comfortable continuing the vicious policies of the Bush years, if BushCo had been held accountable? Not too long after his inauguration, Obama basically said that accountability for the crimes (national and international) of the Bush regime would be “off the table,” because we need to “look forward.” That’s easy to say if A) one hasn’t experienced such unpunished loss, and B) one is planning on continuing the crimes. Indeed, the Obama DOJ has vigorously blocked accountability for anyone in the Bush regime; maybe most notably, John Yoo and Federal Judge, Jay Bybee, who collaborated to formulate the disastrous US torture policy. We have to come collectively out of our “denial” that we live in an Evil Empire that won’t stop, and indeed will use every tool at its disposal, until it drains this planet dry of every drop of oil and every molecule of precious minerals, and it doesn’t really matter who inhabits the Oval Office. We need to get angry enough to actually do something about it and leave the depression stage for the oppressors when their ways of lives are diminished because their wars for profit have ended. And we won’t “bargain” with anybody for peace or justice, we will seize them as we reject the violence of Empire and embrace healing. Finally, acceptance, Never! We won’t rest until we have created a world that is free from the wars of the ruling class and filled with economic equality and environmental sustainability for everyone.